One of the apostles, of course, did not remain in Christ; the danger of cutting oneself off from the vine and eternal life is real. It can happen; tragically, it does happen. It is why we have recourse to Confession, which restores us to full communion with Christ and the Church. Remaining in Christ includes remaining in the Church. So anyone claiming that he is committed to Christ but have wishes to distance himself from the people of God do not know what they are talking about. To say that one only needs the former and can dispense with the latter is an outright lie. Commitment to Christ entails commitment to His Body, the Church. We need both the church and Christ. They’re mutually inclusive - you can’t have one without the other. Our faith is not just personal or individual, as many modern Christians would claim today, but rather fundamentally and essentially communal and ecclesial. Being part of Christ means being attached to the Church, the Body of Christ. When we grow in intimacy with Christ, we must necessarily grow in intimacy with others. So, when people stay away from the community of the Church, from the BEC, from any fellowship with other Catholics, and yet protest that they are disciples of Christ, are living a contradiction. There is another point apart from intimacy, that is put forward by the image of the vine and its branches – it is anonymity. In an age that idolises individual self-expression, in a culture where everyone hopes to have their five minutes of fame whether on a talentime show or on social media, where everyone seems to be fighting for the right to be different and unique, the parable provides a stern critique. In a vine, branches are almost completely indistinguishable from one another, it is impossible to determine where one branch stops and where another branch starts. They all run together as they grow out of the central vine. What the vine image suggests about community is that, there are no free standing individuals in the community. This metaphor of the vine and the branches is stark in its anonymity, that is, the visual image of the branches lacks any and all distinctions in appearance or character of gifts. What is essential is not isolated individuality but rather anonymous connexion with the Vine – apart from it we have no identity, we cannot have life! So when we are genuinely and humbly connected to Christ so too are we intertwined with others in Christ, such that, by our very nature we bond into a community that seems inseparable, organic, woven together in love. So much so that who has what gifts and abilities is secondary - what matters is not who has or who does what, what matters is what we do as part of the whole and what we are together. Because when a branch is cut off, of course, it ceases to be fruit-bearing. When we break away and go our own way, we ultimately cease to be fruit- bearing. But no one can ever claim community life is easy. Just ask the religious and priests who live in communities. We will be the first to tell you how hard it is to live as a community, and how humbling it is to be in a community. One may shine outside the community, but the community is the true litmus test of discipleship. Thus, the parable speaks of the need of pruning. Our Lord speaks of His Father, the vinedresser, doing two things that require a knife. 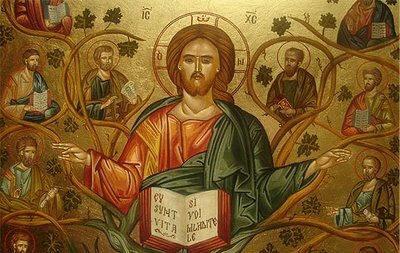 Every branch that doesn't bear fruit, the Father removes, cuts away; and every branch that does bear fruit the Father prunes, so that it may bear more fruit. Likewise, we have to be pruned, bits and pieces, certain practices, vices, or habits or ways of being or ways of speaking need to be trimmed up and off, in order for us to be able to grow in Christ. And more often than not this can be painful, the clipping and cutting, the fraternal correcting, the forgiving and reconciling, the changing of behaviours and attitudes. Pruning is always a painful process. It is a form of loss or death. But, paradoxically, the vinedresser is never more intimately involved than when wielding the pruning-knife! As any good gardening enthusiast will tell you, “Getting roses to bloom means cutting back the canes.” Growing pains. Pruning pains. Changing pains. There is another theme that emerges from this metaphor - being overly presumptuous about our salvation. Such presumption is a sin against hope. It is basically saying that once a person has been baptised, his entrance into heaven upon death is guaranteed. It is what some Evangelical groups would term as the “once saved, always saved” doctrine. But the truth is that we may lose the sanctifying grace we have received through the Sacrament of Baptism by committing a mortal sin. The story of Holy Week leaves us with an important reminder that we should not ignore. One of the apostles, did not remain in Christ; he shared in the first Eucharistic meal but his heart had already been set to betray Christ. Thus, being committed to Christ means continuously being committed to the life of holiness, of personal sanctification, throughout our entire lives and not just be contented with a single moment of grace or conversion. It means remaining in the Church. It is not just enough to receive grace. We are called to remain in the state of grace and if this is not so, we should immediately make use of the sacrament of penance to be reconciled to God and His Church.